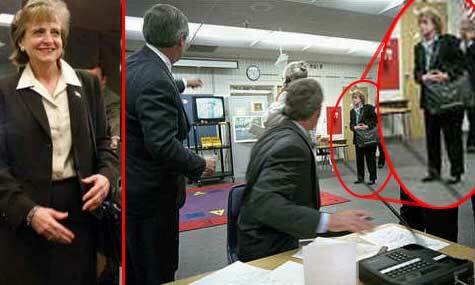 Harriet Miers Accompanied Bush on 9/11? Why did he give a speech an hour later at a known location? Why wasn't he picked up and whisked away like Cheney? Did the Secret Service know he wasn't a target? If you do a quick search on 'Harriet Miers', or listen to much liberal talk radio right now you will constantly hear the term 'cronyism'. Cronyism is pretty readily visible in the Bush administration, especially when looking at those who were in a position of importance on 9/11. Some quick examples of this include George Tenet from the CIA receiving the medal of honor and Richard Myers becoming the Chairman of the Joint Cheifs of staff, both of which were in positions of power (and failed miserably) before and during 9/11. Who else was promoted after failing on 9/11? Is this Harriet Miers? Does it matter? While Miers accompanying Bush on 9/11 may be nothing at all I do think it is worth noting, and I am somewhat curious as to how often Miers, Bush's personal lawyer, accompanied him, especially to minor photo-ops at an elementary school. What else was she connected to? If someone could provide a more hi-res image of this I would appreciate it, otherwise drop some tidbits of information while we wait for the indictments to come through. Another question along these lines that I have yet to see an answer to is why the Director of the White House Situation Room, Deborah Loewer, travelled with the President to Booker Elementary? Perhaps there is a good explanation, perhaps there are other examples of her travelling on Presidential trips? Has anyone seen this question addressed? bb (not verified) on Fri, 10/28/2005 - 1:57pm. No Simon, go back to sleep. They'll be here in the morning. But Mom, I can't sleep. It's too exciting. Can't they put out one indictment now, and the rest in the morning? No Simon! Now get to bed or I'll tell Mr. Fitzgerald you're not to have any indictments at all! Doug (not verified) on Fri, 10/28/2005 - 5:05pm. bb (not verified) on Fri, 10/28/2005 - 11:42pm. David Howard (not verified) on Sat, 10/29/2005 - 5:48am. It's good to see that "Paul Thompson" has finally cleaned up the disinfo in that portion of his timeline: For a long time, "Paul" had it saying that Bush's incriminating 1st WTC hit witness statements were "impossible"! "Paul" blew me off when I pointed out to him this error of his, long ago, so it's very nice to see that he's finally cleaned up his timeline somewhat, though I still take issue with the fact that it traces the roots of 9/11 back to "caves in Afghanistan" (IOW, it still blames 9/11 on Osama and alQueda as if that were still feasible). blimp pilot (not verified) on Sat, 10/29/2005 - 6:11am. BP, are you aware of this transcript? If so, what are your thoughts on it? stallion4 (not verified) on Sat, 10/29/2005 - 8:21am. A devil's advocate might note that if Bush was asked a question about New York along the lines of "do you know what has been going on" and he didn't know, it is also possible that he would say "Yes, I'll have more to say later" even if he didn't know, just to make it sound like he was on top of it. bb (not verified) on Sat, 10/29/2005 - 9:07am. Hey, cool find on Miers and good post. Spooked (not verified) on Sat, 10/29/2005 - 1:36pm.